There are no large coronal holes on the Earthside of the sun. .Credit: SDO/AIA. Neither of these small spots has the kind of complex magnetic field that harbors energy for strong flares. The quiet is therefore expected to continue through the weekend. NOAA forecasters estimate the odds of an M-flare in the next 3 days to be no more than 1%. Before July 17, 2014, the previous spotless day was August 14, 2011, a gap of nearly 3 years. What happened then provides context for what is happening today. Overall, 2011 was a year of relatively high solar activity with multiple X-flares; the spotless sun was just a temporary intermission. 2014 will probably be remembered the same way. As new sunspots emerge and grow, the Solar Max of 2014 will pick up where it left off a couple weeks ago when sunspots were abundant. However, because no one can predict the solar cycle, this "All Quiet Event" is worth monitoring. Follow the action, or lack thereof, on Twitter @spaceweatherman. "Dark clouds passed overhead at midnight, but behind those clouds I could see bright electric ones - the beautiful Noctilucent clouds!" says Hedén. His video highlights the altitude difference between ordinary clouds in the troposphere and noctilucent clouds in the mesosphere. At 80+ km, NLCs are high enough to catch the rays of the sun even around midnight. At 5 to 10 km, tropospheric clouds are midnight dark. The natural habitat of noctilucent clouds is the Arctic Circle. In recent years, however, they have spread to lower latitudes with sightings as far south as Utah and Colorado. Many researchers think this is a result of climate change. Observing tips: Look west 30 to 60 minutes after sunset when the Sun has dipped 6o to 16o below the horizon. 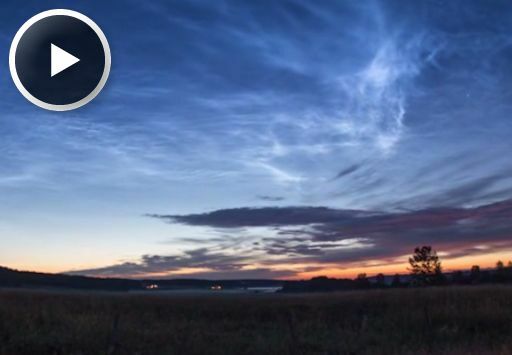 If you see blue-white tendrils zig-zagging across the sky, you may have spotted a noctilucent cloud. 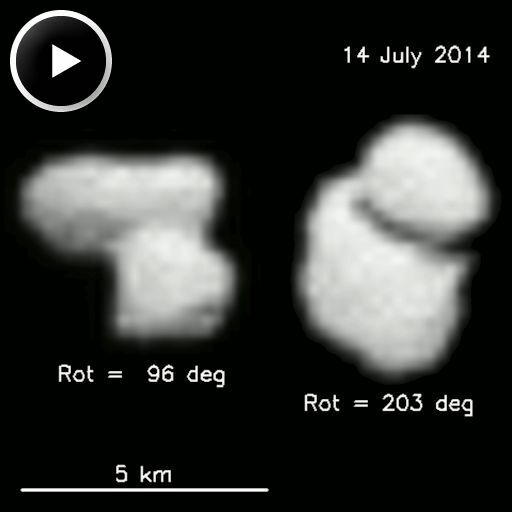 Some observers have noted the comet's resemblance to a rubber duck. The technical term is "contact binary." One elongated object appears stuck to a smaller bulbous piece. No one knows how the comet came to be this way. It could be the result of a slow-motion "sticky collision" between two objects, an odd-shaped fragment of a catastrophic impact, or something else entirely. One thing is sure: This could present some interesting challenges for Philae, the probe's lander, which is slated to touch down on the comet's surface in early November. Many questions will be answered by August 6th when Rosetta reaches 67P and goes into orbit. Stay tuned! On Jul. 18, 2014, the network reported 15 fireballs. On July 18, 2014 there were potentially hazardous asteroids.